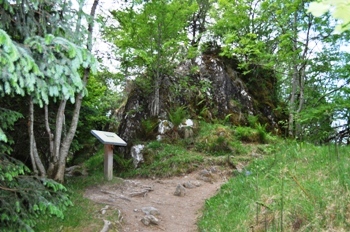 Signal Rock is located within the woodlands of An Torr a National Trust site of beauty, there are many stories linked to Signal Rock but it is most famous for its connection to the Glencoe Massacre. This rock is said to be the place where the signal was given for the attack on the MacDonalds of Glencoe. The story claims this is where a fire was started at 5am to give the signal to the soldiers to begin the vicious attack on the village, but local experts claim this is not correct and the rock was used for other purposes. The rocks original title is “Tom a Ghrianain” meaning the knoll of the sun, and it is said that Druids used this rock because it’s a great location to view the rising of the sun and the sun setting and used for worshiping the sun. It is also claimed that this was a meeting place of the MacDonalds to reach in case of an emergency, or the site where a beacon would be lit by the clan to warn of any dangers and this could be another link to the Glencoe Massacre. Whatever the correct reason Signal Rock is still a historical location and deserves a visit, So how can I find Signal Rock. The rock can be found by taking a small walk through An Torr 1.3 miles from the National Trust Visitor Centre heading towards Glencoe pass, Google map location of the car park below. Towards the end of the car park there is a sign detailing the routes you can take to walk through An Torr and Signal Rock, the route to Signal Rock is the shortest route and should only take about 20 minutes to reach ( this can depend on your walking speed) there are some moderate slopes to get there and also some steps, so decent footwear is needed for this walk. From the car park you will see a wooden bridge crossing the River Coe, cross the bridge an go through the gate and continue up the path following some steps, the path continues to Signal Rock but be careful not to take the right fork in the path as this leads you around the An Torr walk, there are several markers on the walk to direct you to your destination. not long before the rock you will reach a crossroads in the paths and then the path rises upwards before you reach the Rock itself. At the rock you will find an information board detailing the history of the rock, and if you walk around Signal rock you will find some natural steps that will enable you to stand on the top of the rock for some great views of the surrounding Mountains and Woodlands. To return to the car park retrace your steps and this will return you back to where you started, overall I would give yourself 1 hour for the walk including the return. An alternative route for this walk would be from the Clachaig Inn if the bridge is not accessible, and of course this would give you a great reason to enjoy a nice drink afterwards.